But wait. Cue the music. Suddenly, beyond all hope, it happens. In the small desert town of Spangle, California, where Eddie lives, comes a sad young stranger with piercing gray eyes. They are the palest, most stunningly beautiful eyes Eddie has ever seen. Poor Eddie Hightower is swallowed up in their silver depths and disappears without a gurgle. The stranger’s name is Gray Grissom. Gray, like his eyes. Without hesitation Eddie opens his doors—and his heart—to the lost young man. After all, that’s what Eddie does. He finds homes for strays. But this is one stray Eddieintends to keep for himself. Top marks go to the band of strays Eddie has collected at his animal refuge, especially Louie the fluffy white puppy of indeterminate breed who worms his way into Eddie's heart. Louie is instrumental in bringing the MCs together and falls for Gray as quickly as Eddie does. Eddie, who is in his mid-40s, is 20 years older than Gray. Gray reminds Eddie that he's an "old man" at every turn. Gray is not an easy guy to like, truth be told. He's blunt and standoffish, although mostly he's just scared of being left. He pushes Eddie away, even though Eddie does everything in his power to make Gray feel cared for, including moving Gray in with him when Gray breaks his ankle. Because the story is told solely from Eddie's POV, I couldn't fully relate to Gray, even after hearing his sad backstory. I liked Eddie well enough but wished we saw him interact with the refuge animals more. The cats and dogs Eddie keeps as family were pretty damn cute, though. John Inman's writing isn't fancy or formal. He has a very straightforward writing style that's relatable. The first couple chapters were a little slow, with some info dumping about how Eddie came to be owner of an animal refuge, but the story did pick up and ended up being a mostly enjoyable read. 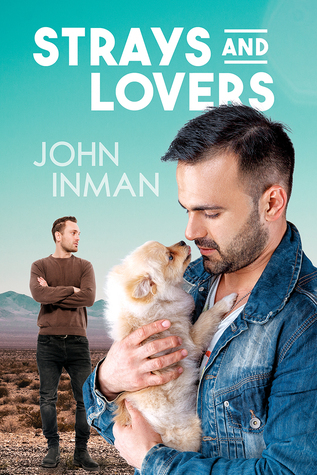 Strays and Lovers is a sleepy, relationship-driven book. It's sweet and subdued but lacks anticipation and oomph. The ending contains at least 50 grams of sugar. It's a strong HFN with a family reunion, some happy tears, and laughter.